Vegan Mischief: I Solemnly Swear That I'm Up To No Good | Occasional updates with new vegan recipes and fun vegan events happening in Vancouver, BC. If you’ve had it before, you’ll know exactly why this is the best salad dressing/dip/spread of all time. Goddess dressing is a vegan-by-default tahini and parsley based dressing that is just magical. This stuff will turn any salad-hater into a ruminant. It’s easy to make it wrong, though, and most store-bought varieties just don’t do the trick. The best store-bought one is Annie’s – but it’s incredibly annoying to find it, at least here in Vancouver. None of my little mom and pop retailers carry the stuff. Luckily, after some false starts, I landed upon the best recipe I could find online – which is, funny enough, at about.com. I modified the recipe a bit and now I really think it’s the ultimate dressing. Make it for yourself and tell me what you think! This is my cat, Hoover, adding his own “special ingredient” to the dressing: cat hair. Start out with a food processor. This is a bit big for a Magic Bullet, but if you’ve halving the recipe you could use that little guy. I’ve not made it in a blender, but if you’re experienced in emulsifying in a blender, go for it. I like my food processor because it has an insert in the top that I can fill with oil and it slowly drips in, making emulsifying a bit easier. If you’re new to making your own dressings, emulsifying is the process by which oil is mixed in with a liquid resulting in a creamy, opaque dressing. It’s the same process by which mayonnaise is made. 2 tbsp – 1/2 cup water – depends on the liquid content of your tahini. Start small and add more if it’s necessary to blend. Combine all ingredients except for the oils in your mixing apparatus of choice and blend until mixed thoroughly. Mix the oils together and very slowly pour in in a thin stream. My food processor has a “pusher” that goes in the access hole in the top. One of the compartments has a little hole at the bottom – so I can just pour my oil in there and it’ll slowly stream in, saving minutes of labour that I can then spend having a glass of wine or petting the cat. Enjoy as a vegetable crudité dip, salad dressing, or sandwich spread (if it’s thick enough – mine never is). Due to the vinegar and lemon juice content, this will probably last in the fridge for a while, but I’ll never find out because I always use it so quickly. Some housekeeping: if you’ve been following this site for any time before this post, you’ll notice a new look. Please let me know if you run into any broken images or other issues. The look has changed due to some WordPress updates that were incompatible with my custom theme. This entry was posted in Photos, Recipes, Sauces, Sides and tagged apple cider vinegar, parsley, tahini on September 22, 2014 by malloreigh. Yesterday was the Vegan Cookoff – the theme was Middle Eastern and North African food. I just had to make shakshuka, a pepper and tomato stew that originated in Tunisia and is popular across the MENA region. It’s often served for breakfast with poached eggs swimming in the thick, sweet sauce, and what a great opportunity to discover some new vegan egg tactics while using some of my old favourites. I based this shakshuka recipe after Yotam Ottolenghi‘s, with a few elements from other shakshuka recipes I found online – I subbed out Yotam’s cayenne for fresh jalapeno, and had (surprise!) run out of saffron so I did not use that. I also didn’t have fresh cilantro/coriander on hand so went with dried. Ottolenghi didn’t use garlic, and I chose not to use thyme. The balance in my shakshuka was perfect, but you wouldn’t lose using his recipe either. In your largest, deepest cast iron frying pan (or use a saucepan if you don’t have a cast iron), dry toast the cumin seeds on high for about 2 min until they are brown in colour. Add the olive oil and turn the heat down to medium-high. Once the oil is hot, add the onions and cook for about 2 – 3 minutes until they start to soften, then add the garlic and cook for another 3 – 5 minutes until the whole mixture is looking dewy. Add all of your peppers, sugar, and spices and cook for 10 – 20 minutes, stirring regularly, until the peppers soften and the whole thing is taking on a red-orange colour. Add tomatoes and cook for another 10 min, then taste. Add salt and pepper and adjust everything else for spice if you need to; remove the bay leaves at this point as well, if you can find them. If you’re adding the eggs, ensure your stew is nicely broken down first – it should have a thick consistency, a nice level of sweetness and a gentle heat. The recipe for the white is based off of one from Chel Rabbit which the author used in their shakshuka. soft organic tofu – don’t use the vacuum packed kind! Combine all ingredients except for tofu and blend til smooth. If you’re a Vegan Mischief follower, you’ll be familiar with this yolk recipe – I found it on a website called The Airy Way and adapted it here for Vegan Mischief. This recipe is designed to be “poached” in a stew. You could probably also use it in other contexts but you’d have to alter the preparation a little bit. Make holes in your stew for your eggs – I made 5. Spoon in a tablespoonful of the creamy white mixture and smooth it into the hole. Scoop out a tablespoonful of soft tofu and place it on top. This is going to be the texture of the white, while the cream is the taste. Let your stew simmer with the white in it for 8-10 minutes so the flavours combine – don’t stir, of course, or you’ll wreck your eggs. In the meantime, prepare your yolk. If you have a microwave, this is a bit easier, but I have done it on a stovetop before as well. Combine all of the ingredients in a small bowl or small skillet and melt – in a microwave, zap for 20 seconds and then whisk. On a stovetop, melt and then whisk. Now, the key is to warm it and whisk it until it is a creamy bechamel or egg yolk consistency, and then IMMEDIATELY remove it from heat because if it gets past that point it will separate. If it separates, it still tastes good but it looks gross. In the microwave, zap for 5 second increments, whisk, and then put it back in if you still need to. On the stovetop, warm gently while whisking until it’s perfect. Scoop a teaspoonful of yolk into the centre of each white. Turn the heat off and serve. Shakshuka is usually served straight out of the cast iron – bring it to the table with some fresh toasted flatbread and a big serving spoon and let your dining companions feast on it in the messiest way possible! This entry was posted in Breakfast/Brunch, Lunch, Photos, Recipes and tagged peppers, stew, tofu, tomatoes, vegenaise on June 17, 2014 by malloreigh. i looked up so many spinach and artichoke dip recipes and just could not find what i wanted. i didn’t want low-fat, i didn’t want a complex multi-day cashew soaking process, and i didn’t want fake cheese. i ended up just throwing some ingredients together and wound up with a simple, delicious, and satisfying dip that was exactly what my friends and i were craving for our superbowl-themed movie watching party. preheat oven to 350f if you will be eating this right away. if you are using fresh spinach, throw it into a dry skillet heated to medium-low and let the water steam off until it wilts. press the spinach up against the side of the pan to release the water and allow it to steam off. if you are using frozen spinach, thaw it and drain it well. combine all ingredients in a food processor and process til blended. if you don’t have a food processor, mince everything and mix it well. using a bread knife, cut a circle around the top of the bread and hollow it out. chop the hollowed bread into cubes. place the bread bowl and cubes on a baking sheet and fill the bowl with the mixed dip. bake for 15-25 minutes based on how hungry you are. for a gluten-free dip, bake it in a small baking dish or large ramekin and use tortilla chips. i can’t believe this is all i did. i don’t normally have vegan sour cream in the house but someone left some in my fridge from a cookoff recently. and i DO always have vegan mayonnaise and so should you because it’s the best. vegenaise specifically. This entry was posted in Photos, Recipes, Snacks and tagged artichokes, spinach on February 2, 2014 by malloreigh. Tofu scramble: the most beautiful of vegan breakfasts. Getting it at a restaurant is usually disappointing; I’ve never once had a scram at a restaurant that was as good as the one I make at home. My recipe is here: Malloreigh’s Semi-Famous Tofu Scramble. Like all of my tried-and-true recipes, this one is approximate. I alter all of the ingredients every time I make it, depending on how thick my coconut milk is, what type of mustard I’m using, and what vegetables I have. The consistencies are important, too, though – always get that tofu sauced up before you start chopping your onion for maximum flavour. Never put too much liquid in it or it’ll be tough to brown it before you add your veg. Be prepared to adjust, because the taste of tofu is crappy, and the taste of flavour is AWESOME. So that’s the most recent scram I made, on Saturday morning. It was the same formula as usual – coconut milk, nutritional yeast, mustard, and fenugreek leaves for the tofu, plus vegetables. I used a nice seedy dijon mustard which added a good texture and flavour… I will do this again! Also, I added a whole bunch of kale, torn into pieces. Remember always to discard the stalks as they are woody and fibrous… but get every bit of that leaf in there, yum. I added the kale and zucchini when the tofu was pretty much done (letting it sit on top of the tofu), tossed a bit of the liquid from my coconut milk in, and put a top on to let it steam til it was bright green. Then I stirred it all together and cooked it for a bit longer to get all the flavours infused. This was possibly one of the best scrambles I’ve ever made. This entry was posted in Breakfast/Brunch, Photos on March 11, 2013 by malloreigh. Hello there, friends and vegans! It’s been a while since last I posted; I’ve been working full time AND going to school full time, so I hope you’ll forgive me. Anyway, I wanted to post about my entry in the last vegan cookoff. Just to refresh your memory, the cookoff is a monthly event some friends and I have been doing for four (count em, FOUR) years solid. Everything has to be vegan, and these days, nut-free as well, and it suits the purposes of the aspiring winner to offer a gluten-free entry or option as well, as we have three gluten-free participants. The theme, date, and location is chosen the month before. Everyone brings the components of their dish, assembles on location, and serves small portions to all of the attendees. At the end, everyone who’s eaten votes in each of five categories, and a winner is crowned. The photo of mine hasn’t been uploaded yet, so here’s one from Tried and True Favourite Recipes! Our last competition was Caribbean-themed. I made Trini doubles – a street food dish from Trinidad involving chana masala (my favourite Indian dish made with island flavour) stuffed into deep-fried bread dough. It’s simple and it’s delicious. I chose to serve mine with a fresh salsa made of mango, cucumber, lime, jalapeno, and cilantro. The whole thing was quite hot, but so delicious! Now, I’ve tried to make chana many times before and have never made an authentic-tasting one. This was my first success with a chana masala that tasted like I’ve had it in restaurants. Heat a medium-sized pot on just under medium heat on a burner. Add oil and let it heat for a minute before adding the onions. They should sizzle slightly, but if they spit at all, turn the heat down. Stoves vary a lot, so it’s best to know whether your stove runs hot or cool. Mine runs hot, so I saute my onions on heat 2 or 3 (electric). Gas ranges often run hotter than electric because of the direct and instant heat. Stir the onions to ensure they don’t get stuck or burnt. While your onions are cooking, in a small bowl, combine the minced garlic, grated ginger, and dry masala. Add a splash of water (I like to use warm) and mix it all together so it combines into a paste. Once the onions are softened, add the caraway or coriander seeds. Ensure there’s enough hot oil in there to coat the seeds – stir it together and cook until they are toasted. Then, add your spice paste and stir it all together to toast the spices and cook the garlic and ginger. While this is happening, drain and rinse your chickpeas. Add them to the pot next and stir to coat everything equally in the spices. Next, add the diced tomatoes. This provides some liquid to cook the chickpeas further til they’re soft. If it looks dry, add a little water. Add the bay leaf now and stir. Bring it to a boil, then reduce to a simmer. Put a lid on and let it go for at least 20 minutes, better at an hour or even more. Continue to stir it every so often and ensure there is enough liquid; you don’t want it to burn to the bottom but you also don’t want it to come out too liquidy at the end. You need to scoop it up with fry bread! Holy mackerel are there a LOT of curry powders out there. There’s Japanese curry, Thai curry, Indian curry, Island curry, and so on, and within each type of cuisine there are a number of variations as far as spice combination goes. For a successful chana masala, you will want a MASALA MIX or a CHANA MASALA MIX. Look for a spice mix that contains coriander, clove, cinnamon, chili, turmeric, and ginger. Chana masala should be heavy on ginger, coriander, and – believe it or not – lemon! You don’t want any lime flavour, nor cumin. If you want to make your own spice mix, use those listed above. A little cardamom wouldn’t hurt either. The “pie spices” complement the chickpea and tomato in chana masala. If you want to vary the spiciness of your dish, making your own spice mix is a great idea. You can chop fresh chilies in with the garlic and ginger, or add chili powder or cayenne with the dry spices. This part is super easy. While your chana is simmering, make some bread dough. My bread yeast was dead, so I used instant pizza yeast and actually just made a pizza dough. You don’t have to spice it – just salt it. You don’t need much, either. When you fry the dough, it’ll puff up and bubble so you can cut it open and put chana inside it. YUM. To deep fry, choose a deep pot with a small diameter. Fill it with about 2 inches of oil with a high smoke point (sunflower/canola/veg oil) and heat it on high. Ensure you have a plate next to the stove with paper towel on it to drain, as well as a metal or silicon (NOT PLASTIC) slotted spoon, tongs, etc. You’ll know it’s ready when you put a wooden spoon in, touching the bottom, and little bubbles immediately rise from the wood. BE VERY CAREFUL if you are new to deep-frying! Tear off little chunks of bread dough and toss them in – do no more than three at a time so the oil doesn’t lose too much temperature. Watch them turn golden, turning if necessary, and then pull out to drain. Serve hot. Oh, and I won the cookoff with this dish. This entry was posted in Breakfast/Brunch, Lunch, Photos, Recipes, Sides, Snacks and tagged bread, chickpeas, coriander, cucumber, mango on February 26, 2013 by malloreigh. I thought I had posted this recipe here but when I came back to the website to search for it I didn’t find it! What an oversight on my part – this is one of my most famous recipes ever. I infused these snickerdoodles (sugar cookies with cinnamon) with lavender after smelling my lavender hair conditioner and cinnamon-sugar soap at the same time in the shower. True story! Anyway, I’ve been making these for years. Add more lavender flowers if you really like the flavour – up to double the amount will simply make them more fragrant and delicious. These cookies are quite crumbly, soft, and dry when baked according to the directions. I am working on altering the recipe to produce a moister cookie that is easier to form. Mix dry ingredients in a large bowl. Mix wet ingredients in a medium bowl. Add the wet ingredients to the dry and mix together until an even dough forms. Cover the bowl and set it in the refrigerator for half an hour. Preheat your oven to 350 degrees Fahrenheit. Roll one-inch cookie dough balls in the cinnamon sugar mixture and place on an ungreased cookie sheet. Flatten each with a fork. Bake for 6 – 7 minutes. Watch closely – you want the cookies to be golden but soft. They take exactly 6 minutes in my oven but have taken 8 – 10 in someone else’s. Makes 20 cookies, give or take, depending on how much dough you eat. This entry was posted in Dessert, Photos, Recipes on October 12, 2012 by malloreigh. 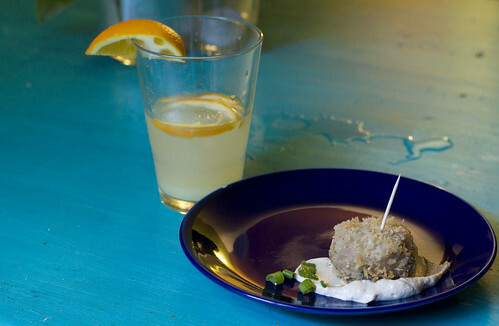 I made these sticky rice risotto balls for one of our vegan cookoffs. Everyone loved them! I tend to go overboard on oil when I make cookoff entries, so you could potentially half this. Heat a large, deep skillet or saucepan over medium heat, then add the shallots. Stir often with a (preferably slotted) wooden spoon until soft. Add chopped shiitake mushrooms and saute, stirring often, until soft. Add the tamari to the broth. Add the rice and sake/soju/wine; stir and let come to a simmer. Once the level of the liquid has gone down, add a cup of broth, stir, and let come to a simmer; let the liquid get low, then add another cup broth. Repeat, stirring often, adding liquid every 5 – 10 minutes, until the rice is cooked – this should take 30 – 40 minutes. Test for al dente and remove from heat. Add salt and green onion, stir to incorporate, taste for flavour, and add more soy sauce or tamari if it’s lacking. Now you will want your risotto to cool. If you have heaps of time, you can just leave it out, but I put mine in the fridge for about an hour. Once it’s cooled, lay out some wax paper and start forming them into balls. You can do these whatever size you like. I made a mixture of silken tofu, Daiya, miso, and tamari, but it might be better with some nicely marinated tofu inside, chopped into small pieces. You also don’t need to stuff them at all. To stuff, flatten a risotto ball, put a small amount of stuffing on top, wrap it up like a purse, and close with a pinch of your fingers. Re-roll gently into a ball. Mix the flax and water for an egg wash. Put the flour in a shallow bowl or saucer; do the same for the panko, but add the sesame seeds and mix. Dip each ball first into flour, then into the flax mixture, then into the panko and sesame seeds. Enough oil to submerge your risotto balls in; you are deep frying. If you don’t want to do that, feel free to bake them. They are still delicious this way. Heat the oil at medium until dropping a piece of rice into it sets it to rolling and fizzing. Fry each ball til it’s golden brown – BE CAREFUL – and remove gently with heat-safe tongs to a plate covered with paper towel to drain. I served these with a swipe of creamy Japanese sesame-citrus salad dressing. This will do, or a rice vinegar-soy sauce, plum sauce, or any other dip. Eat with chopsticks or place each one on a toothpick for party-friendly finger foods. This entry was posted in Photos, Recipes, Snacks and tagged green onion, rice, shiitake, tamari on June 20, 2012 by malloreigh. This recipe was conceptualized by Yotem Ottolenghi in his cookbook “Plenty”, I made it vegan and gltuen-free for our april brunch. The recipe I have is not exact therefore I am not going to put it up on our website. I strongly suggest picking up the cookbook “Plenty” and playing around with some of his recipes. The book is simple and does justice to the vegetables that he works with. Simple. This entry was posted in Breakfast/Brunch, Product Reviews and tagged arugula, gluten free, Hazelnut, spinach on May 8, 2012 by kaylie. This Recipe comes from one of my favourite places in Albuquerque, New Mexico. When We visit again we will definitely be staying here http://www.lospoblanos.com/. This is the veganized adaptation of the blue corn muffins from Los Poblanos. Preheat oven to 350 degrees. Using the pan grease, grease the muffin tins well. Sift the dry ingredients into a bowl. Add the melted earth balance and add the remaining wet ingredients. Mix until just combined. Fold in the pears. Fill the muffin tin and bake for 20-25 minutes. This entry was posted in Breakfast/Brunch, Dessert, Photos and tagged Albuquerque, blue corn, flax, Los Poblanos, Muffin, pear on April 12, 2012 by kaylie. – Heat oil over medium heat in a sauté pan and add sunchokes covering with a lid in order to steam them through. – Add Cumin, Caraway, Salt and pepper and toss. Continue to cook and keep covered for approx 2 minutes. – Add 1/4 c bbq sauce. Toss and keep covered for 5-8 mins. Toss constantly. – Add the remainder of the bbq sauce and salt and turn up the heat. Toss and caramelize the sunchokes making sure they have nice brown edges. Remove from heat and serve. This entry was posted in Dinner, Lunch, Meta, Photos, Recipes, Sides on April 7, 2012 by kaylie.